Thailand and Britain have each discussed the idea of joining the trade bloc, but Britain will have to wait until it leaves the European Union. Other possible new members include Taiwan, South Korea, the Philippines and Sri Lanka, the Financial Times reported. Mr Trump said in January that he would be open to the US rejoining the trade bloc if it could get a "substantially better deal". CPTPP ministers said the pact promotes high standards for broader economic integration in the future. "Ministers expressed their determination to complete their domestic processes to bring the agreement into force expeditiously," said the statement. The CPTPP will make it easier for Singapore companies to do business in the region, the Ministry of Trade and Industry (MTI) said. The agreement will significantly eliminate tariffs and non-tariff barriers for goods. It will also allow service suppliers greater access to business opportunities in a wide range of sectors, and increase their access to government procurement contracts in other countries. MTI added the door is open for like-minded countries to join the pact once it has entered into force - that is, after six members ratify it. Leaders must now sell the CPTPP to their countrymen, some of whom have organised protests. Activists in New Zealand protested against clauses that would allow foreign firms to sue the government for unfair breaches of contract, arguing this was tantamount to selling the country's sovereignty. But New Zealand signed letters with five nations which agreed not to sue, and Trade Minister David Parker said the pact was a "fair deal" for the nation. Singapore will need to make legislative amendments to meet its CPTPP obligations, Mr Lim said last week. "The CPTPP members intend to try and achieve ratification before the end of the year, so Singapore will also strive to do that." 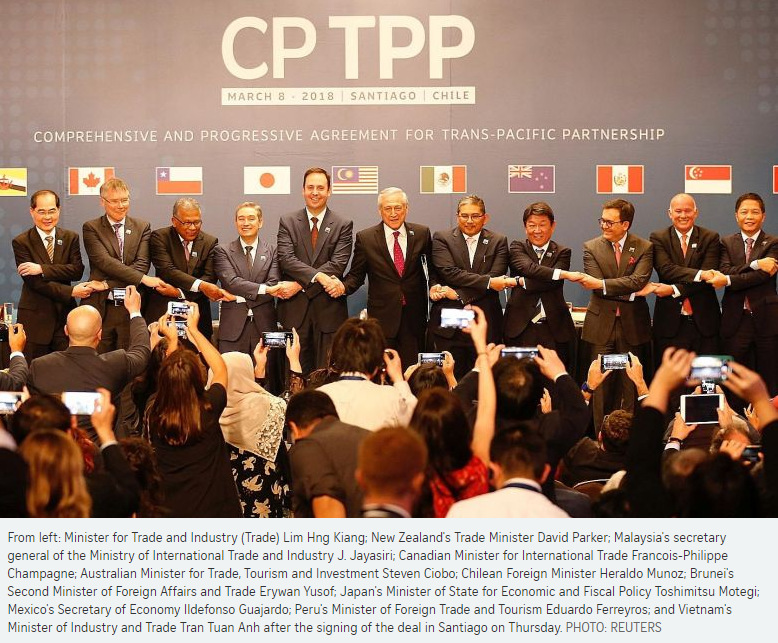 The sweeping trade deal signed yesterday in Chile has unlocked considerable potential for Singapore firms, the Ministry of Trade and Industry (MTI) said yesterday. Minister for Trade and Industry (Trade) Lim Hng Kiang, who was in Santiago for the signing, noted: "Singapore companies will be better placed to tap growth opportunities and increased market access in the Asia-Pacific. "With its high standards and business-facilitative trade rules, the CPTPP establishes a new regional standard for future free-trade agreements." 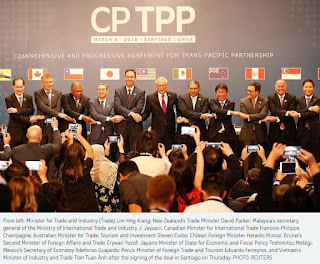 The 11 member countries will now work on their respective domestic ratification processes for the CPTPP, or the Comprehensive and Progressive Agreement for Trans-Pacific Partnership, as the pact is known. The Singapore Business Federation (SBF) said it will promote opportunities that the trade deal offers to local firms, especially for small and medium-sized enterprises. Over the last five years, exports of goods to CPTPP countries have accounted for more than a fifth of Singapore's total goods exports, noted SBF chief executive officer Ho Meng Kit. The SBF is interested in questions such as how existing Singapore exporters to the CPTPP countries can benefit, and how firms interested in entering those markets can leverage provisions in the agreement for easier entry. The 11 markets represent about 13.5 per cent of the world's gross domestic product and a market of 500 million people. Singapore companies are expected to benefit from the substantial elimination of tariffs and non-tariff barriers for goods, improved access for service suppliers in a wide range of sectors, greater facilitation of investments and improved access to government procurement contracts. DBS chief economist Taimur Baig said: "The Asia-centric nature of the agreement benefits Singapore as well, as the bulk of its trade takes place in the region. Improved access to the services market in Asia would be particularly beneficial to Singapore's growing service sector." 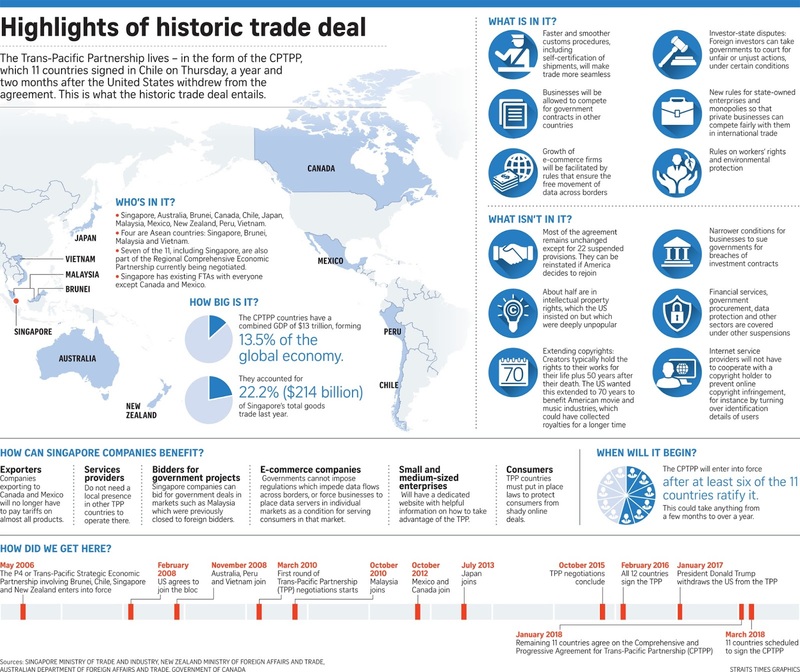 The CPTPP rose from the ashes of the Trans-Pacific Partnership (TPP), after the withdrawal of the United States from the trade pact in January last year. The revised pact incorporates the original TPP, but with some provisions suspended. The MTI noted that "the door is open for like-minded parties to join the CPTPP once it has entered into force". Ratings agency Moody's said that gains from the CPTPP will be smaller without the participation of the US but that the trade deal will still boost all members' exports and incomes. Singapore is expected to be the second-biggest winner from the CPTPP after Malaysia, added Moody's, citing a report by the Peterson Institute for International Economics. The October 2017 report estimated that the CPTPP will provide a 2.7 per cent boost to Singapore's real national income in 2030 compared with a scenario without the trade pact. 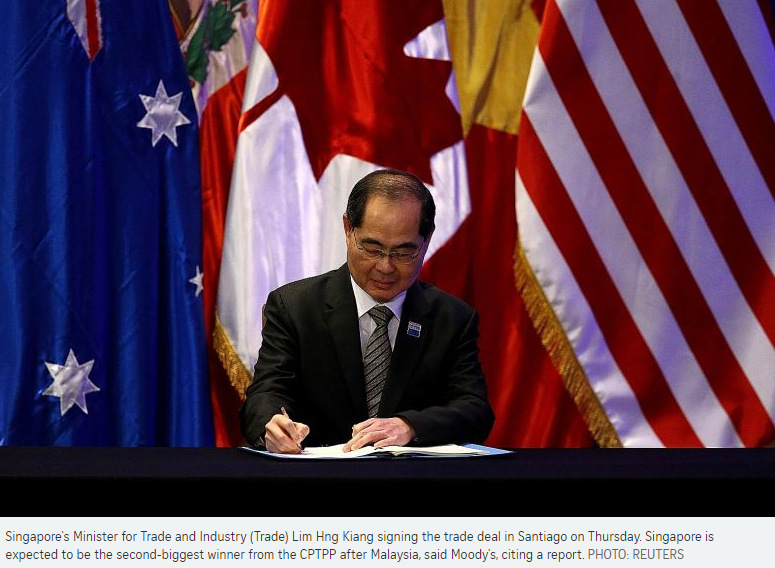 Moody's noted: "Singapore already has trade deals with eight CPTPP countries. Nevertheless, Singapore's exporters will benefit from new preferential trade access to Canada and Mexico, and unprecedented access to Japan, Australia, New Zealand, Chile and Peru." The other CPTPP countries are Brunei, Malaysia and Vietnam.